What a trip! We are currently in Big Sur overlooking the entire central coastline of California. We just finished shooting a Wedding this past Wednesday, a place we have been dying to shoot in now for the past several years. This location holds a special place in our hearts as this is where we got engaged. With the wedding being held on a Wednesday we made a little trip out of it and headed up to Monterey on Monday to explore. 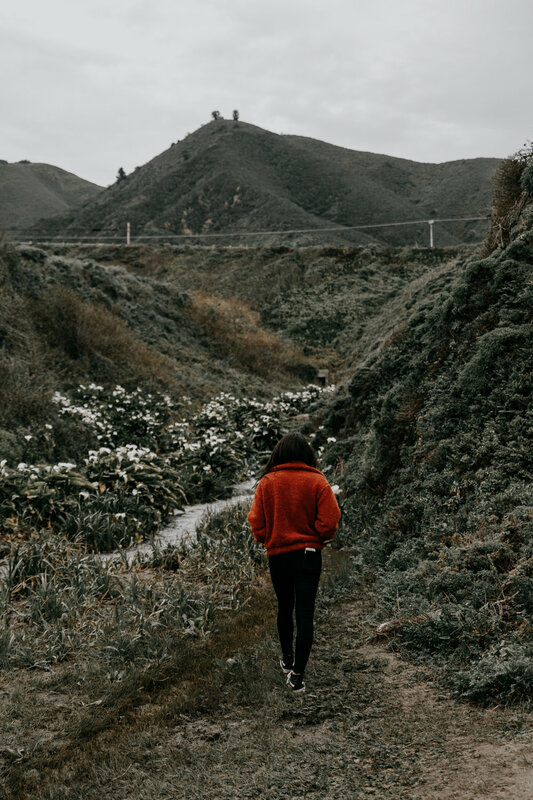 Here is a look at our own travels throughout the week from exploring this incredible place and a few things we highly recommend. Fort Ord Dunes State Park - We pulled off the 46 from the 5 and stumbled upon massive hills of rolling sand dunes. We had never seen this side as we usually don’t enter from this way but glad we found it! We parked our cars across the street at a local gas station (same center as Target shopping center) and crossed the street to check it out as there is not parking off the highway. Once we got over and climbed up the hill, there was nothing but infinite coastline, there was absolutely no one in sight except a fisherman casting a line from the shore. Pacific Grove - This is the area where we stayed in. It is a quiet, quaint part of town in Monterey and super peaceful. We stayed at Lovers Point Inn where our hotel had a direct ocean view. 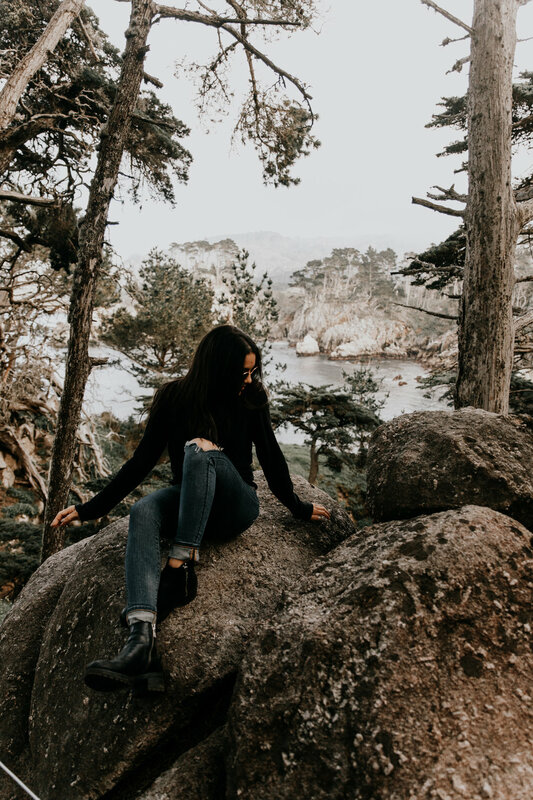 The coves and rocks extend the entire coastline, and is just a 10-15 minute walk from Canary row and all the main attractions near the aquarium. Asilomar State Beach - Heading south, this coastline leads to Asilomar State Beach and once again is a crown jewel to visit when in Monterey. There are so many great places to eat when visiting here, these are a couple places we ate at and really enjoyed. The Fish Hopper - Walk up Fish and chips/ Calamari and fries/ Clam Chowder bread bowls… we were in. This place is an outside extension of a fine dine restaurant right on the edge of the dock. Order your food here and eat outside overlooking the ocean. Gianni’s Pizza - Man this was some of the best pizza we have had in awhile. Authentic, old school style italian pizza. Definitely recommend hitting this place. Sly McFly’s - Live music and cocktails great for late night bar food as many places close early. This place is open all night and fun place to hang out. Well, I’m not really sure this needs to be describes as there are vista points just at about every turn for you to pull over to see, but I thought I would add in a couple cool spots as you make your way up toward Monterey from Los Angeles. You really can’t go wrong with any lookout points here as each offers a complete different perspective. 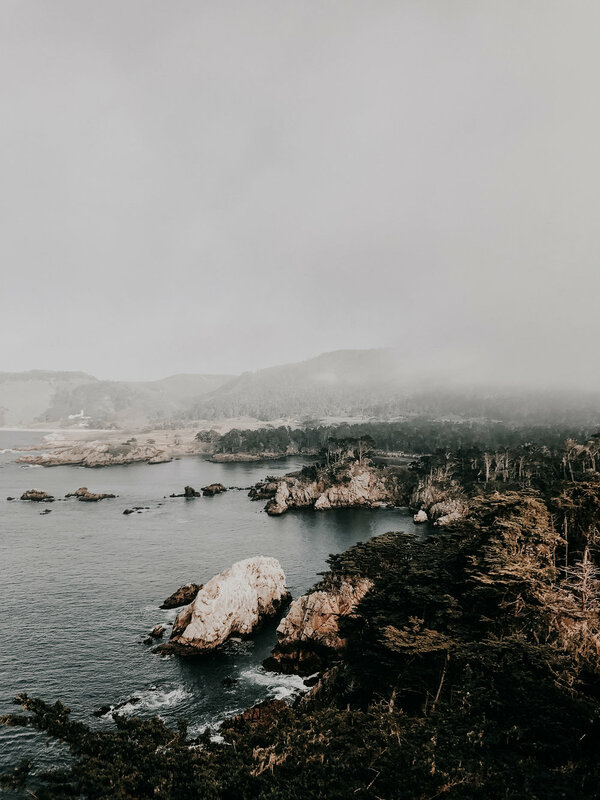 Point Lobos State Park - This is the first spot we hit after adventuring through Carmel, it is a scenic coastal area that features a variety of sea animals & wildlife, hiking, and can even dive/snorkel at designated areas. We made it to the edge of the hike and saw otters playing with one another and whales breaching deep in the sea. Toward the end of the night we hiked down to China cove which has a large cave you can see from the top of the trail and has a great view of Bird Island which has thousands of birds that nest on top of a gigantic rock in the middle of the ocean. Kasler Point - In between Rocky Point restaurant and Kasler point there is an area to access the coast. This was one of the few spots we noticed that had coastal access, we winded down a dirt path and met a stream that was gushing with natural water from the backdrop of the mountains behind us. Flowers were in full bloom as the green plants met the sand at the bottom of the coast. Highly recommend checking this place out. Castle Rock - Castle Rock offers incredible views of the coast and jagged rocks that extend out into the ocean. This is just past Bixby Bridge. Once you pull into the scenic are of the forest from the coast there are a few places to stop and refuel for food. These are the places we stopped at. Big Sur Taphouse - Great selection of craft beer and good food. We ordered the tacos which were a great portion size, we had one of each beef, pork and chicken. The layout and overall vibe in the restaurant was super cool with an old cabin feel and little nooks to sit at including an area that was dimly lit and almost felt like a cubby style seating area. There is also a deli that connects to the tap house so if you wanted to grab a sandwich to go from next door you are able to do that as well. Big Sur River Inn - Another place that many rave about, we stopped here to check it out and go to the restroom and the first smell you smelt was that of sizzling bacon. Although we didn’t eat here, it seems like a great place to check out. About us: We are Andy and Brittney, husband and wife based in San Diego California. We live in north Pacific Beach and are destination wedding photographers. You can find us enjoying sunset at one of the local beaches just down the street from us or enjoying a glass of wine at Carruth Cellars in Little Italy. We absolutely love being able to call ourselves wedding photographers in San Diego and is the dream career. Congratulations on your engagement, and hope to talk soon! 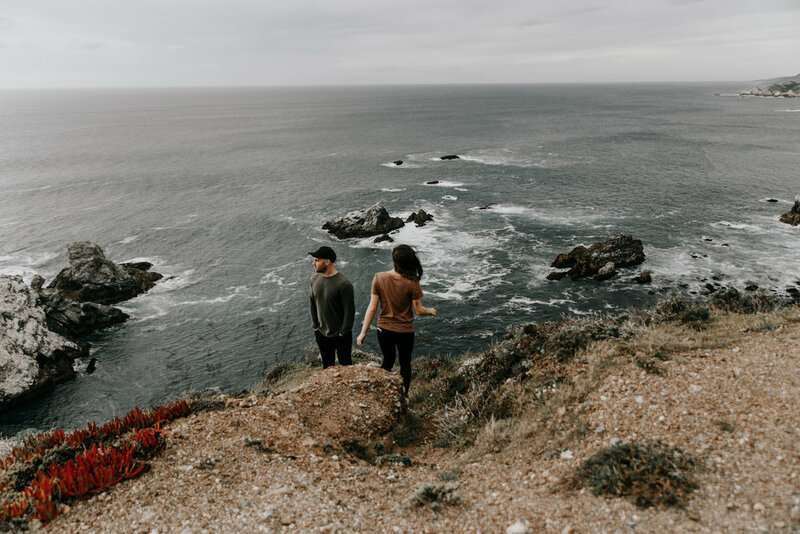 After driving up and down the coast and walking miles and miles along the edge of the ocean we have a handful of our favorite spots we are able to recommend if you are searching for your engagement photographer in San Diego. 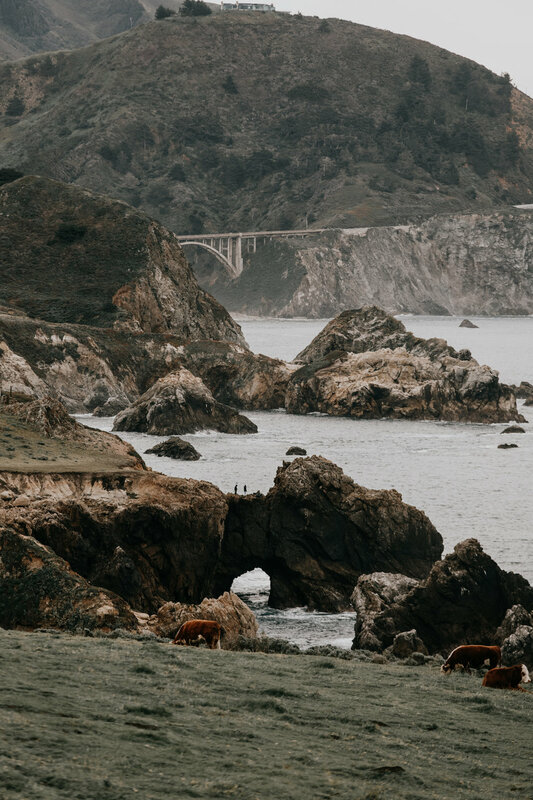 If you are already engaged and looking for a coastline in Southern California to elope and celebrate your marriage with just you two, then definitely hit us up! 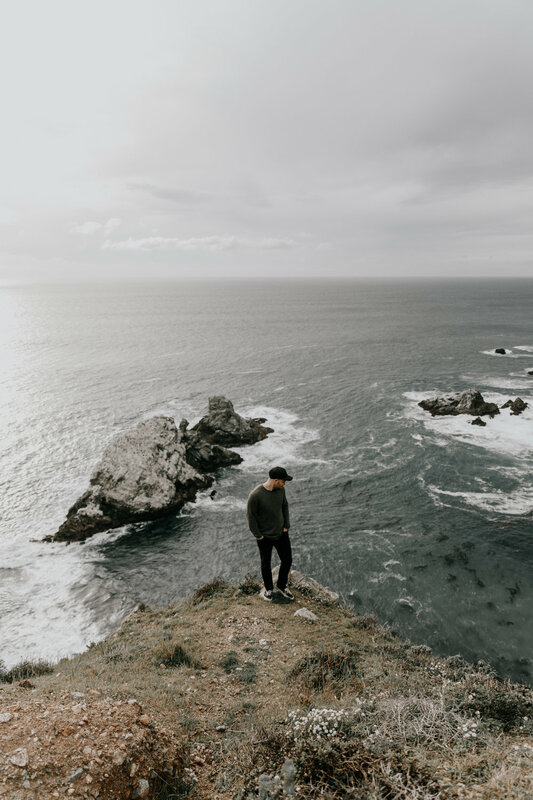 We have worked with so many creative couples who have wanted to celebrate their marriage overlooking the cliffs of the Pacific Ocean and it is hands down one of our favorites to capture these moments. If you are searching for an elopement photographer in San Diego we would love to hear from you.